After my recent article about coping with haters, a reader named Sandy left the following comment. Although I'm skeptical that looking at my personal portfolio will be useful to anyone, and although I've already shared most of the following information at Money Boss and at Get Rich Slowly, let's take a look at how my money is invested. First, though, let's talk about how I used to invest. Before I decided to become boss of my own life, I did some dumb things with money. I was especially bad at investing. Like many Americans, I didn't understand the difference between investing and speculating. I looked at the stock market as a place to get rich quick. I didn't have the knowledge or patience for long-term planning. During the early 1990s, I followed my cousin's advice and began investing in mutual funds. Over the course of a very long year, I plowed a little more than $2000 into a variety of Invesco mutual funds. But I cashed out all of my money when I decided I needed to buy a Macintosh Classic II computer. In March of 2000, as the tech bubble reached maximum size, I jumped on the bandwagon for the Palm Pilot IPO. On the day the stock went public, I bought as many shares as possible. Within weeks, I'd lost half my money. My final bout of investing stupidity? In the autumn of 2007, I had dinner with a friend who worked at the corporate offices of The Sharper Image. He told me that the company's stock price had dropped but management was certain they could turn things around. It was just a passing remark in a much larger conversation, but I took it as a sign. The next day, I bought $3500 worth of Sharper Image stock at $3.14 per share. (That was the bulk of my Roth IRA money for 2007.) Within a few months, The Sharper Image declared bankruptcy and the value of my stock dropped to $200. Then to zero. Gambling and speculating are fundamentally non-money boss activities: outcomes are at the whim of fate. Investing, on the other hand, is a conscious, directed activity that relies on discipline, knowledge, and patience. The following section is taken directly from the Money Boss Manual. Start early. “The amount of capital you start with is not nearly as important as getting started early,” writes Burton Malkiel in The Random Walk Guide to Investing. “Every year you put off investing makes your [goals] more difficult to achieve.” The secret to getting rich slowly, he says, is the extraordinary power of compounding. Given enough time, even modest investment returns can generate real wealth. Think long-term. It takes time — decades, not years — for compounding to work its magic. Plus, there's another reason to take the long view. In the short term, stocks are volatile. The market might jump 30% one year, then fall 20% the next. But in the long run, stocks return an average of around 10% per year (or about 7% when you factor inflation). Spread the risk. Another way to smooth the market's wild ups and downs is through diversification, which simply means not putting all of your eggs into one basket. Own more than one stock, and own other types of investments (such as bonds or real estate). When you spread your money around, you decrease risk while (counter-intuitively) earning a similar return. Keep costs low. In Your Money and Your Brain, Jason Zweig notes, “Decades of rigorous research have proven that the single most critical factor in the future performance of a mutual fund is that small, relatively static number: its fees and expenses. Hot performance comes and goes, but expenses never go away.” Warren Buffett has bet a million bucks that, because of high fees, an actively managed hedge fund cannot beat an average market index fund. He's winning the bet, and by a wide margin. Keep it simple. Most people make investing far too complicated. There's no need to guess which stocks are going to outperform the market. In fact, you probably can't. For the average person, it's much easier and profitable to simply buy mutual funds. Make it automatic. It's important to automate good behavior so that you don't sabotage yourself. You want to remove the human element from the equation. I recommend creating a monthly transfer from your checking account to your investment account. And if you have a retirement plan at work, ask HR to max out your contribution via payroll deduction. Ignore everyone. You might think that a smart investor pays attention to daily financial news, keeping his finger on the pulse of the market. But you'd be wrong. Smart investors ignore the market. If you’re investing for twenty or thirty years down the road, today’s financial news is mostly irrelevant. Make decisions based on your personal financial goals, not on whether the market jumped or dropped today. Conduct an annual review. While it does zero good to monitor your investments day to day, it's smart to look things over occasionally. Some folks do this quarterly. I recommend once per year. An annual review lets you shift money around, if needed. And it's a great time to be sure your investment strategy still matches your goals and values. How would you put the Money Boss investment philosophy into action? The answer is shockingly simple: Set up automatic investments into a portfolio of index funds, mutual funds designed to match the movement of the market (or a portion of the market). Note: Unlike some financial bloggers, I don't believe that index funds are the only answer. They're a smart answer and the best bet for the average person, no question, but there are other investment strategies that match my philosophy. And here's a secret that maybe I shouldn't tell: Even outspoken index fund advocates usually have some portion of their portfolio dedicated to experimenting with other investment strategies. With the background out of the way, let's answer Sandy's questions. What stocks and funds do I hold? Why Fidelity and not Vanguard? In 2008, I wanted to open a self-employed 401(k) with Vanguard, but the company didn't offer one. I went with Fidelity instead. As a result, I chose to invest in Fidelity funds — which turned out to be cheaper than Vanguard funds. (This isn't true across the board, but it's true for the funds I hold…except the REIT.) I believe both Fidelity and Vanguard can be fine choices for individual investors looking to keep costs low. When we set up Kim's individual investment account, we used Vanguard for both the funds and the brokerage. Note that I haven't included the value of my home in these calculations. I've only included my active investment portfolio. If we add in the condo, then it makes up 29.81% of my net worth, the Fidelity funds are 63.46%, and the bonds are 4.47%. What Criteria Do I Use to Shift Funds? This one's quick and easy: I don't shift funds. In the past seven years, I haven't made a single transaction to move funds around. I think market timing is impossible on a micro level. Nobody knows what's going to happen from one day to the next. And while it might be possible to guess at broad trends — both the stock market and the Portland housing market feel frothy right now, for instance — there's no way that I, personally, have the knowledge necessary to guess when the next crash is coming. So I don't even try. Many people practice rebalancing, of course, which means they adjust their portfolio at regular intervals so that it doesn't become too heavily weighted in one area. Say your target is to have 60% in stocks and 40% in bonds. At the end of each year, you might evaluate your current portfolio to be sure your allocation is close to that. If stocks have had a good year, you might find they make up 72% of your portfolio! In that case, you'd sell some shares and buy more bonds. I have a high risk tolerance. And the more I read, the more I'm convinced that the ideal allocation is 100% stocks. That's my target. (Your target, obviously, will likely be something different.) I move closer to that target every time a bond matures and leaves my portfolio. No need to rebalance. My portfolio is 79% stock right now. I'm happy with that. I'd be happy if it were 89% stock, but that's not going to happen. Because the funds I own also happen to contain some small percentage of bonds, I'm likely to always have about 15% of my money in bonds. I'm fine with that too. Really, I think trying to find some sort of perfect allocation is impossible. It's a fool's errand, a red herring. It's part of the optimization trap. I think you should pick a good target and get close to it, but not worry about total precision. The less you trade, the more money you save. Warning: Again, I want to stress that I have high risk tolerance. My own research leads me to believe that the best long-term asset allocation is 100% stocks. Your own risk tolerance and research will likely lead you to a different conclusion. What's my rate of return? Sandy asked me to share my quarterly rate of return. I don't have that info, and I don't think it's useful. However, Fidelity does provide a couple of reports that show returns over time. Let's look at them. You can click either of those to get a larger, easier-to-read image. As you can see, my personal rate of return lags behind the S&P 500. Why is that? Because my portfolio isn't 100% stocks! Still, I have nothing to complain about with a 10.58% annualized return since 2008. That number makes me very happy. I'll admit: That international fund looks problematic. Its poor performance puts a drag on my portfolio's overall returns. Still, I have no desire to sell it. It's a piece of diversification that gives me peace of mind. How Much Do I Invest Each Month? Lastly, Sandy wants to know how much I invest each month. This is another easy one. I don't. I do not have a regular income, so I don't make regular investments. I'm no longer in wealth accumulation mode; I'm in wealth preservation mode. I have achieved Financial Independence, which means my net worth should be sufficient to support my current lifestyle for the rest of my life. Having said that, I do hope to make more money in the future. I have Enough, but it'd ease my mind to have a little more, to create a buffer between me and bad times. As my income increases, I'll first funnel money into my Roth IRA. If I'm able to build my business in the way I hope, I'll eventually resume contributions to my self-employed 401(k) plan (which is 100% invested in FFNOX). Truthfully, I'm eager to make more money soon. I really do think the stock market has been riding high for a very long time and we're due for a drop. When it falls, I'd like to have some money to put into it. That's it. That's how my money is invested. But now I'm curious. How is your money invested? What stocks and funds do you hold? What criteria do you use to shift funds around? How much do you invest each year? And what have your rates of return been like? Are you happy with your portfolio? What would you like to change? And why? There are 18 reader responses to "How I Invest My Money". My funds mirror yours quite closely, except I use Vanguard instead of Fidelity. I’m also in wealth preservation mode. The best part of this post is the admission of the many money mistakes. I think most people remember their wins better than their losses, or at least they talk more about the wins than the losses. And it’s always good to get a look under the hood. We’ve got fairly similar portfolios. I’ve published the details on my PoF Portfolio, pretty much all in Vanguard index funds, holding 60% US Stocks, 20% international (10% developed, 10% emerging), 10% REIT, and 10% bonds / cash. Last year, pretty much equaled the S&P 500, this year, outperforming by a few percentage points. Totally agree that the best part about the post is how JD admits what he did wrong. I’ve found the best investors are the most open about their mistakes. The others tend to be salespeople rather than people really living off their capital. It’s more or less a wash whether you go with Fidelity or Vanguard these days. I have a Schwab Roth IRA and I went with a target retirement date portfolio for all IRA contributions. I answered their questions in such a way that I’m recognized as having a high risk tolerance. In my non-IRA portfolio, I do the Schwab version of the S&P500 and the S&P Total Market for the majority of my investments. Simple and understandable, and no trading costs. Because I am interested in learning about Dividend Growth Stocks, I bought one REIT stock just to see what it is like. I don’t consider that an investment, but more of a learning opportunity. Once I have more disposable income to invest, I want to be armed with knowledge. I’m experimenting with replicating DFA funds by screening individual stocks. I try to make a random sample of a list of stocks then invest equal amounts across them. Compared to the S&P I’ve been smoked the past few years so I’m just going to hold on and see what happens. What is your process for randomly selecting stocks? Thank you for sharing. I notice you have a high allocation to stocks and corporate bonds. I wonder how you protect your open profits and gains if and when these trends roll over. 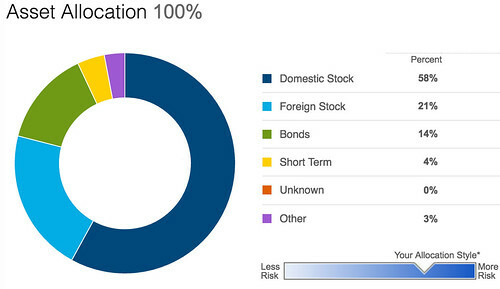 If you do not go 100% stocks, where else do you allocate? 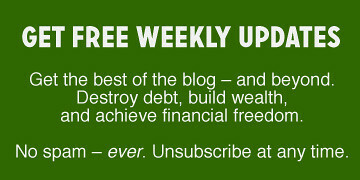 Thanks for sharing – especially the money mistakes section. It is always valuable to see the mistakes people make on their way to success. Out of curiosity, what is the thought process behind dividing the domestic stocks into S&P, Extended, and All-in-One rather than just putting it all in something like a Total Market fund? Love the blog and appreciate what you do! I’m 47 so this may be a little aggressive but I also own 75% of my house with the expectation it will be paid off in 3 years so I feel like that gives me some extra security. I own the REIT because I hate how little bonds pay but I worry about the market. I wonder what protection(s) you have in place to protect your unrealized gains and principal in the event that your worry materializes as a bear market develops. Hats off to you for taking up the challenge Sandy threw your way. Funny that he/she hasn’t felt the need to comment on your article yet, isn’t it? – I live in the UK so taxes, available accounts and available investments do differ as do costs for running accounts. I normally use http://www.xe.com for any calculations on exchange rates – just in case you want to look up $values for my £values. And last but not least: Apologies for a long post. How is your money invested? What stocks and funds do you hold? I have 3 investment pots – 1 pension through my employer, 1 pension I invest myself and 1 ISA (tax-advantaged account). 1) Pension through my employer – I pay in 7% of my pre-tax income each month and they match it like-for-like with 7%. This money goes into an account with Zurich Investments and is then automatically invested into 3 funds (33% UK, 33% World without UK, 34% Emerging Markets – total overall cost 0.644% per year, i.e. £1.000 invested = £6.44 fees). Last time I checked the pension was up by 21%. I used to have all money going into a single fund but the cost of this fund was 1.41% per year, i.e. £1.000 invested = £14.10 in fees. I changed this in January 2016 to the current setup and haven’t looked back since. I can change these funds at any time without incurring costs but I am happy with it so I just leave it well alone. I am changing jobs as of October – the new company pays matching contributions up to 5% so that’s what I’m going to pay in as well- 5%. I don’t know yet where the money is going to be invested in so can’t say anything about this at the momen. I will have 3 options: move my money from Zurich to the new company’s pension scheme, move my money from Zurich to my SIPP, see below, or simply stay put and invested via Zurich. Until I know where/how the new company’s pension scheme works I will simply stay put with Zurich and let it run. 2) Self Invested Personal Pension (SIPP) – I have a pension account with a provider and pay in around 10% of my after-tax salary each month. The provider then claims back the 20% income tax which I paid on this money – this is called tax relief and the money is credited into the same account 2 months later and can be invested as well. equal or greater than the money I pay in each month and I then make an additional purchase for the same amount as my regular contribution with the accrued money separately. This pension currently consists of a total of 24 dividend-paying holdings (Vanguard ETF, OEIC Fund, shares of individual companies, Investment Trusts, REIT’s) – all bought for the long term with no intention to sell. Apart from the fund which is accumulation units and reinvests all dividends into itself all other holdings pay quarterly dividends. This account is with the same provider as the pension under 2). Each month I pay in around 15% of my after-tax salary. I add any dividends which have come in since the last purchase and then normally make 2 purchases. However, every now and then there is enough money in the account to purchase 3 holdings. I review my portfolio every 6 month publicly, the last review can be found here: http://boards.fool.co.uk/pinch39s-hyp-end-of-year-4-review-13402975.aspx?sort=whole#13402975. As of October I will be purchasing one holding per month of these shares. I am happy with the portfolio as it is and there is nothing which needs changing currently. However, I may well decide at some point in the future to either add or reduce holdings. This is likely to change as the provider has announced changes to the fees they charge – 0.25% per year going forward on the type of investments I hold. However this is capped at £25 per quarter = £100 per year. Once the portfolio value goes above £40K the cap kicks in and the fee charged stays at £100 meaning that the fee charged as a %age decreases. 4) I pay just under 16% of my after-tax salary each month into a number of 1 year savings accounts with fixed/variable interest rates for the duration. Total average savings rate for accounts 2), 3) and 4) between January and now: around 46% but the range goes from around 25% in January to just under 56% in April. And what have your rates of return been like? Sorry, can’t answer that. At least not in the usual measure of %up or %down against any index. I haven’t unitised my spreadsheets and I do not benchmark against any indices. My only benchmarks are my personal expenses and on this measure I can increasingly cover more and more of my bills each month/year. And when looking at my overall number for FIRE I can see that I am making progress. (Very) slowly but surely the numbers keep getting bigger. Just plodding along and investing each month seems to be doing the trick just fine as compared to the previous tax year I have already received 2/3 of last year’s dividend and we still have another 7 months to go (the UK tax year is 06/04/2016-05/04/2017). What criteria do you use to shift funds around? The only time I have shifted funds around was when I changed the fund I was investing in 1) Pension through my employer in January. The main reason was that this fund was trying to be a World Tracker – and I could do the same with better overall coverage for a lesser overall price. Hence I’ve changed funds and haven’t looked back since. Each year in November / December the government announces by what amount the State Pension (Old Age Pension) is going to increase the following April (the UK tax year goes from 06/04 – 05/04 the following year). I am increasing my contributions into the 2) SIPP and 3) ISA by the same %age but round it then up to the next full £5 or £10. I thought it might help anyone not living and investing in the UK if I provide some links/explanations. Please feel free to post / email me if you need further information. Companies are free to offer their own workplace pensions in addition. These schemes must at least be equal to the workplace pensions offered by the government however I know of company pension schemes, including the scheme I am currently a member of, which offer higher like-for-like matches. 3) ISA (tax-advantaged account) – The ISA I am using is a Stocks & Shhares ISA. The increase to state pensions is worked out via the ‘triple lock guarantee’ – currently the state pension does rise every year. The triple lock was introduced by the coalition in 2010 and was a guarantee to increase the state pension every year by the higher of inflation, average earnings or a minimum of 2.5%. This is being announced in November / December each year and applies from the beginning of the new tax year the following April – UK Tax Year runs 06/04 – 05/04.